We're big fans of thinking outside the box: pre-fab homes, homes with built-in slides, church conversions -- the more unconventional the living situation is, the better! But ironically, our latest attempt at thinking outside the box when it comes to luxury homes led us -- quite literally -- into a box. An 8-by-20-foot shipping container, to be precise. Well, six of them, actually, stacked on top of one another -- though you'd never be able to tell at first glance. When we first laid eyes on this stylish Southampton home (built right on the sand ... ahhh), we thought it could have easily passed as just another edgy million-dollar beachfront contemporary. Inside the $1.395 million home, however, are some more obvious, telltale signs of its more humble past. See for yourself. Like what you see? Christopher Stewart of Prudential Douglas Elliman has the listing. 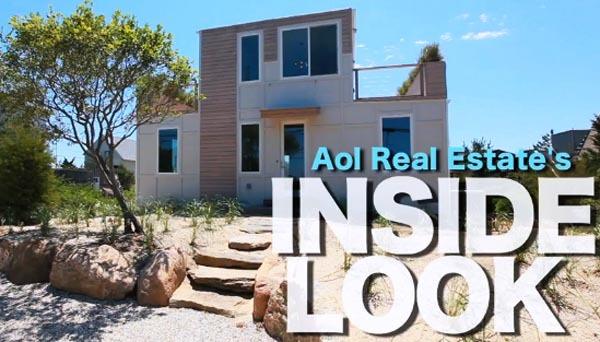 Follow AOL Real Estate reporters Krisanne Alcantara (@krisannetraz) and Teke Wiggin (@tkwiggin) on Twitter (@aolrealestate).